The proximal humerus is a common site for primary osteosarcomas as well as chondrosarcomas. Metastatic tumors occasionally involve the shoulder girdle and are often treated using the same resection and reconstruction techniques. Limb-sparing resection of the proximal humerus is challenging. Despite theircomplexity, these resections can be performed in approximately 95% of patients with high- or low-grade sarcomas. Amputations are rarely required. Endoprosthetic reconstruction is the most common technique for reconstructing large proximal humeral defects. It is used following both intra-articular (Type I) and extra-articular (Type V) resections (see Chapter 9). This is combined with local muscle transfers to create shoulder stability, cover the prosthesis, and provide a functional elbow, wrist, and hand. 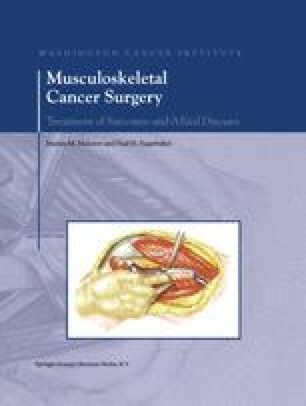 The surgical and anatomic considerations of limb-sparing procedures of the proximal humerus and the specific surgical techniques of intra- (Type I) and extra-articular (Type V) resection and reconstruction are described in this chapter. Total humeral replacement is briefly described.